The exterior of the Newseum, a 250,000 square-foot museum dedicated to news, is seen in Washington, DC, February 21, 2008. WASHINGTON — The Freedom Forum announced Friday that the Newseum will close at the end of 2019 following the sale of its Pennsylvania Avenue location to Johns Hopkins University. The museum, located at 555 Pennsylvania Avenue, opened in 2008 as an institution dedicated to educating the public about the importance of a free press and the First Amendment. The museum includes seven levels with more than a dozen galleries and theatres. Its permanent installations include a memorial to journalists who’ve died in the line of duty, an archive of historical newspapers going back centuries and one of the largest displays of sections of the Berlin Wall in the World. 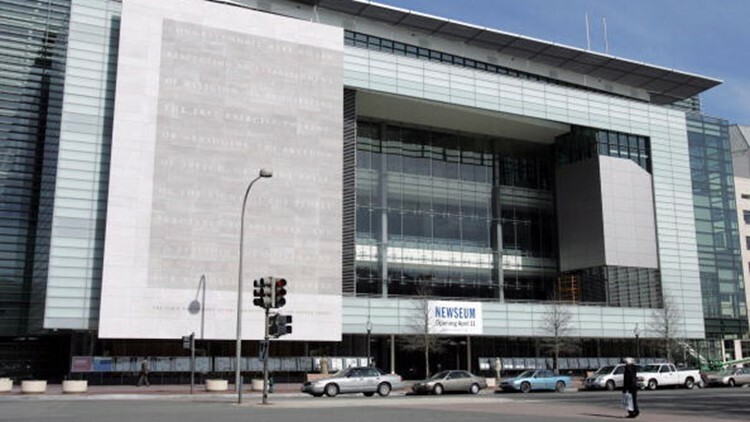 Despite drawing more than 800,000 visitors a year, the Freedom Forum – which founded the museum and serves as its primary funder – said in a release Friday that the Newseum’s operating costs had proven to be unsustainable. A 16-month strategic review completed by the organization determined that selling the Pennsylvania Avenue building was “the best path forward” to enable the organization to continue its mission. To that end, the organization said Friday that it had reached an agreement with Johns Hopkins University to purchase the building for $372.5 million. Johns Hopkins said the purchase of the building will be funded through the sale of the university’s existing D.C. properties, university funds and philanthropic support. The university will move its School of Advanced International Studies, currently housed on Embassy Row in Dupont Circle, to the Newseum location once renovations are complete. The Newseum will remain open through 2019, and the organization plans to “continue to be responsible stewards” of its collection of historic artifacts and newspapers, according to its statement. A Newseum spokeswoman said Friday the organization was not yet answering questions about the fate of specific exhibits, including the news archive and the Journalists Memorial. “We stand ready to continue much of the Newseum’s important work for decades to come — through digital outreach, traveling exhibits, and web-based programs in schools around the world, as well as hopefully in a new physical home in the area,” Neuharth said. The Freedom Forum said the sale of the building remains subject to regulatory approval.